The delicate nature of coral reefs. Coral reefs are perhaps the most visually stunning ecosystems in the marine environment. Often described as the “rainforests of the sea,” they abound with colourful life, ranging from the corals themselves to the multitude of fish species that dart around the reef. Unfortunately, they are also one of the most threatened ecosystems on the planet, and prominent coral scientists have predicted that these wonderful oases of biodiversity and productivity might become a rarity within the next 10 to 20 years. The threats that coral reefs face are numerous. Diseases caused by bacteria, viruses and fungi have become increasingly common in recent decades. Coral bleaching events have also become more prevalent; the last year has seen Australia’s Great Barrier Reef experience a 29% decline in live coral due to bleaching, with some areas of the reef losing as much as 70% of their live coral. Overfishing and destructive fishing practices also impact the health of coral reefs by disrupting their natural ecological process and by causing physical damage to the reef structure. Coastal development is another major cause for concern. Coral reefs are intricately linked to mangrove forests through ecological connectivity (for example, many reef fish live among the mangrove roots early in their life, where they are provided with abundant food and protection from larger predators, before moving out to the reef to complete the adult phase of their life). Furthermore, the mangroves bind sediments that might otherwise be carried onto the reef by water currents, covering the corals and eventually smothering them. Unfortunately, mangroves tend to be the first casualties of coastal development, removed to provide space for marinas, promenades or beaches. The increased development brings more people to these coastal areas, resulting in more pollution, more water-based activity, and a greater demand for seafood—all of which add to the environmental stress. The Arch is a dive site off South Caicos, shown here undamaged after this season’s hurricanes. Then we have the big one: climate change. While the most publicised effect of climate change is the increase in air and sea temperature, otherwise known as global warming, this is only half of the problem when it comes to the marine environment (albeit a huge problem, and one associated with the aforementioned diseases and coral bleaching events). Sometimes referred to as “global warming’s evil twin,” ocean acidification is quite possibly the biggest threat to not only coral reefs, but to the oceans as a whole. At the onset of the Industrial Revolution, the concentration of atmospheric carbon dioxide was approximately 270 parts per million (ppm), the same level that it had been for the preceding 10,000 years. Since then, the concentration of atmospheric carbon dioxide has increased to over 400 ppm due mainly to the burning of fossil fuels—an increase of 33% in less than 300 years. A large proportion of atmospheric carbon dioxide is absorbed by the oceans, so increased atmospheric carbon dioxide naturally leads to increased carbon dioxide in the water, and this is where the problem of ocean acidification begins. Carbon dioxide molecules and water molecules react to form carbonic acid, but carbonic acid is a relatively unstable molecule and quite readily breaks apart into two components, namely hydrogen ions and bicarbonate. It is the increase in hydrogen ions that is reducing the pH of the ocean, causing it to become more acidic. The bad news for animals that produce hard structures such as shells, and our corals that produce their characteristic limestone skeleton, is that the decreasing pH of the oceans causes these structures to dissolve. Studies on small marine molluscs known as sea butterflies have shown that their shells completely dissolve in a matter of days at pH levels that our oceans are predicted to reach by the middle of this century. But again, this is only one part of the problem. Carbonate is a substance that occurs naturally in ocean water, and many organisms combine it with calcium to produce their shells. Corals also use it to produce their stony skeleton—the very framework of the reef. But, carbonate and hydrogen ions are naturally attracted to each other and they bind together to form another bicarbonate. Although this process helps to reduce the rate of acidification by trapping the hydrogen ions in the bicarbonate molecule, it has the unwanted effect of also trapping the carbonate, meaning that there is less free carbonate available for animals that use it to form their shells or skeletons. So our corals are facing a two-pronged ocean acidification attack: on one side the decreasing pH of the ocean makes their skeletons more prone to dissolution, and on the other side there is less carbonate available to them to form their skeletons in the first place! SFS CMRS staff perform the first visual survey of the area around The Plane on South Caicos since the hurricanes. In the grand scheme of things, human impacts are a relatively recent problem for coral reefs. Bearing in mind that the coral reefs we see today have been growing for thousands, and in some cases millions of years, they have obviously had to contend with entirely natural sources of disruption during their formation. Wave action, storms and hurricanes are just some of the natural phenomena that shape the reefs and control their development. Even reefs that are geographically close to each other can be dominated by entirely different coral species, depending on the physical conditions locally. Reefs that are found in areas with constant wave action tend to be dominated by robust boulder-like coral species, while the more delicate branching species are limited to less energetic environments. However, even the most sheltered coral reefs are prone to occasional high-energy wave action during storms and hurricanes, and the frequency of these events will have a strong controlling effect on the types of living coral present at any one time. And so, with all of the potential challenges that they face, how have the coral reefs of the Turks & Caicos Islands fared? The good news is that they are actually among the healthiest of all the reefs in the tropical western Atlantic. 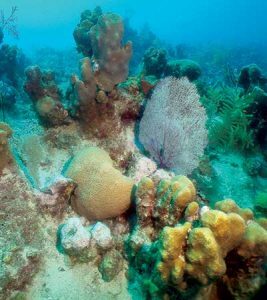 That is not to say that they are in absolutely pristine condition—ocean acidification is a global problem, and coastal development continues to be a matter for concern, but our reefs have been relatively free of the disease outbreaks and mass bleaching events that have afflicted coral reefs elsewhere. At the SFS Center for Marine Resource Studies on South Caicos, we undertake research on many aspects of the local marine environment, ranging from the biology and ecology of key species and ecosystems, to the impacts of exploitation and resource management approaches. 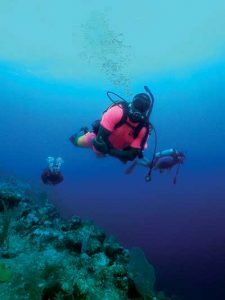 Naturally, this means that we spend a great deal of time in the water actively studying and passively observing the wonderful underwater world of the Turks & Caicos Islands. Our staff have been involved in marine research all over the world, but there is a definite consensus among us that there is nowhere quite like this place. So, after the Islands were pummelled by Hurricanes Irma and Maria this year, we feared that many of the reefs might have experienced catastrophic damage. With the help of the East Bay Resort and Split Finger Ltd. on South Caicos we set out to assess the impacts. Thankfully, most of the sites that we visited were still in very good condition. Some extensive damage was observed on shallow reefs down to depths of around four metres, but below this it was more or less business as usual. Some coral colonies had been broken or cracked by the wave action, but they were still alive, and the fish populations were as vibrant as ever. Given the magnitude of Hurricane Irma in particular, and considering the destruction it caused on land, the reefs of the Turks & Caicos appear to have had a very lucky escape. Looking to the future, it is to be hoped that the coral reefs of the Turks & Caicos Islands will continue to thrive. It will take some time for damaged areas to fully recover, but as long as we can minimise negative human impacts, recover they will. Climate change, including ocean acidification, is a global problem that can only be tackled on a global scale, but there is still a lot that we can do locally to help promote the health and vitality of our precious coral reefs.